Diet Coca-Cola partnered up with heart-health organization The Heart Truth this month for heart month. The partnership is a two-year strong relationship between the two organizations to help promote women’s heart health. 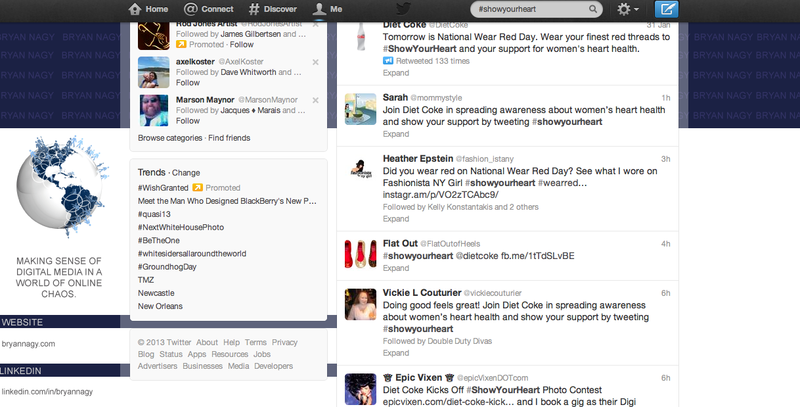 As part of its partnership, Diet Coca-Cola launched a contest on Twitter and Instagram called “#ShowYourHeart. The contest becomes one of many social media marketing tactics used by the soda maker. 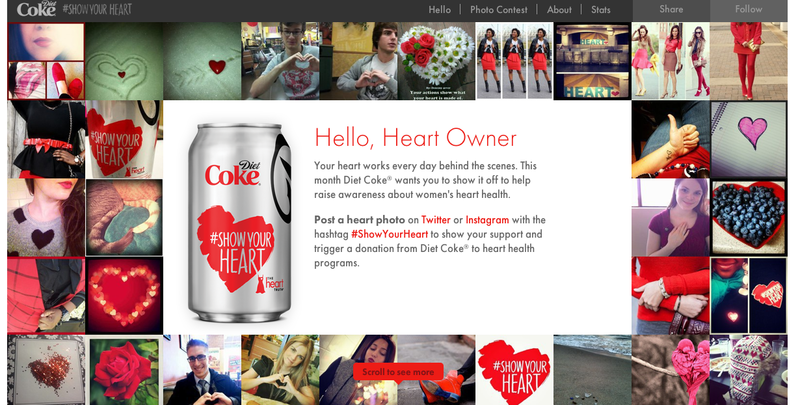 In Diet Coca-Cola’s #ShowYourHeart contests, the company wanted users to show they care about heart month and everything that comes with it. Users were asked to share photos related to the cause that were inspiring, sentimental, and depicting something in the shape of a heart. 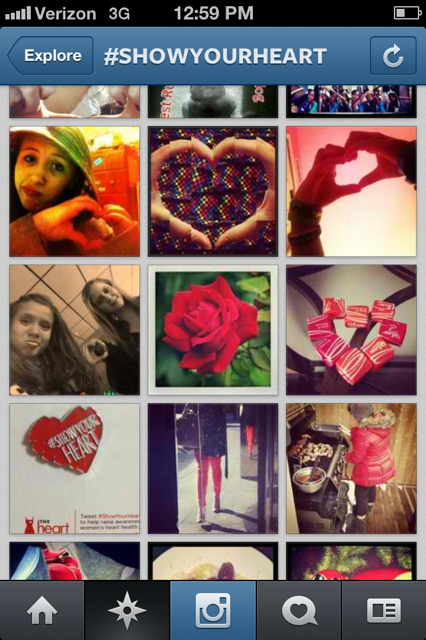 These photos had to be tweeted or instagramed with the hashtag #ShowYourHeart. Visitors of Coca-Cola’s website were notified of the contest. The contest itself took place a month before heart month (which is held in February, ironically due to Valentine’s Day- I’m guessing it helps exposure). Five winners were selected at the beginning of February. These winners were invited to the Red Dress Collection Fashion Show held by The Heart Truth in NYC on February 6th. Not a lot of time to plan for these winners, but hey, they won either way. 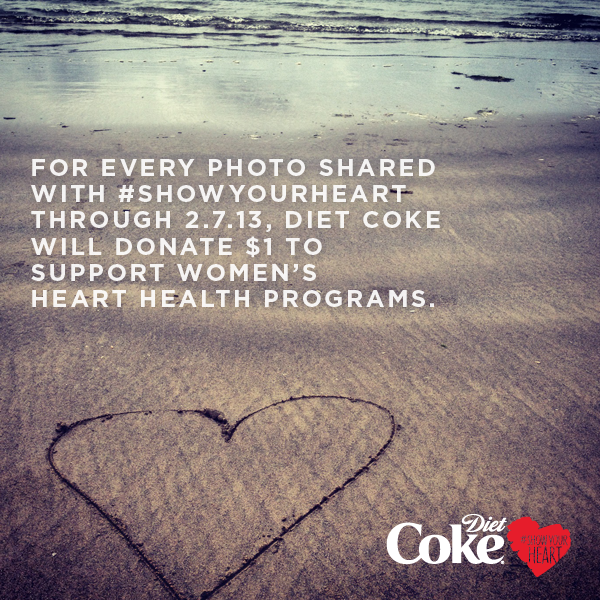 Despite the end of the contest, Coca-Cola announced it would donate $1 to The Heart Truth for any photo shared against the #showyourheart handle through February 7th. Coca-Cola will donate $1 for every photo shared. The Diet Coca-Cola Twitter and Instagram contest generated thousands of entrants and was quite the success. Searching through both sites with the #showyourheart hashtag, you’ll find the entires and comments by users. It’s quite interesting to see them all and realize how many people jumped on to the contest to help out. The contest is a great example of social media done right. Social media is about engaging the customer, not blasting messages saying “buy our product!”. Consumers were engaged here. Twitter users were engaged with the brand. Instagram saw many entries for the contest. So, you may ask, what is the benefit of this contest to Diet Coca-Cola? It engaged users with the Coca-Cola brand. These users followed Coca-Cola, found the contest pertinent to them, and created content on their own time to share with the company. The end result is more brand buzz, favorability, and likelihood users will purchase Coca-Cola over its competitors. It showed the “healthy side” of Coca-Cola. By using the contest against its Diet Coke brand, Coca-Cola helped brand the product as the “heart healthy choice.” This eases the concerns of those watching their waistlines- or their heart! It tied into other marketing. For example, for a limited time Diet Coca-Cola cans will display The Heart Truth’s logo on them.